Taking on a derelict farm building in Abbeyleix, Co. Laois, Arthur and Carol have built a beautiful home. 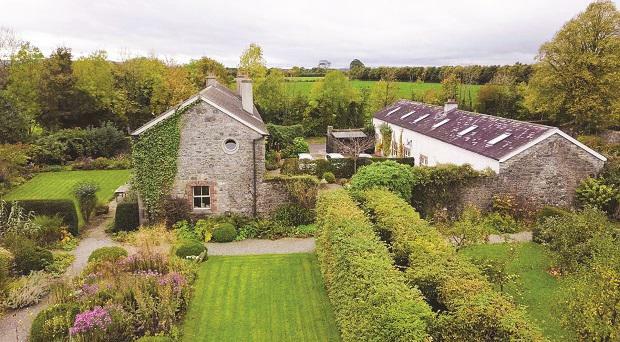 When you walk into Arthur and Carol’s home in Abbeyleix you would never know that, when Arthur found it twenty years ago, it was a derelict farm building. It is a wonderful home that welcomes you with open arms, just like its owners. It has been a labour of love over the years and what you find is a cheerful, homely, country house that makes you feel comfortable immediately. Upon entering the house you’re welcomed into a country kitchen; the AGA range is well used. Epitomising a true country house, Arthur and Carol spend more time in the kitchen than they do anywhere else in their home. The kitchen leads to a living room painted a sky blue that is light and airy and from the windows you can see the flowers of the garden. The house is comfortable, but pared back, it’s functional but not overly serious. There’s a lightness in this house that is a reflection of Arthur and Carol’s personalities. The aesthetically simple furnishing of the house perhaps has its roots in Arthur’s background. He comes from a Quaker family, and their honest and simple aesthetic is very much reflected in every aspect of this home. Arthur is a garden designer and he has created theirs from scratch. It bears his hallmarks as a designer in that he likes strong structured elements, but he also likes things to go a little bit wild too. It was Arthur’s upbringing that inspired his love of gardens and the design aesthetic in their home. Arthur is a relative of the legendary Antarctic explorer Ernest Shackleton. Today everyone is aware of his cousin’s exploits, but as Arthur was growing up he wasn’t overly aware of the figure in the family’s history. While Ernest took on the monumental task leading Antarctic expeditions, Arthur took on his own task of building a house from a derelict farm building. It’s not something you would take on easily, a renovation like this can become a life’s work. When asked if there are similarities in his own journey, Arthur is agreeable. Of course, a house wouldn’t be a home without a personal touch and Carol’s presence is everywhere. A lot of the things you see around the kitchen are made by relatives, the plates are made by Arthur’s sister in law in Vermont, and Carol Booth’s paintings hang on the walls. Carol’s work is inspired by the Irish landscape, painting the feeling of the landscape rather than the form of the land. There’s a dreamlike quality to her work that touches on the surreal. 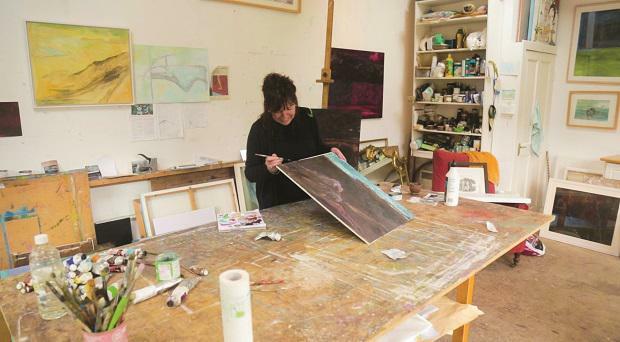 Carol Booth has a separate studio in the garden and it’s a place she loves to escape to. Artists’ need their emotional and physical space to create and Carol is no different. Arthur and Carol have five children between them, so they always have visitors. It’s a great pleasure for them both to have the place buzzing with people. They love to entertain and Carol is a passionate cook who enjoys using their home-grown produce from their vegetable garden to experiment with new recipes. This home is a pleasure to explore, from Carol’s paintings hung proudly on the wall, to the lush, joyous garden that brings so much pleasure to all who enter it. If you could design a life for yourself, a perfect country home, with a beautiful garden and an artist’s studio in the back, a welcoming kitchen and plenty of room for visitors, it might just look something like this. Our House is a 6-part series created in partnership with Ulster Bank. Focusing on a range of different people in Ireland and how they choose to live their lives, we look at the relationship between people’s homes and the way they live. Every home starts with a house and the first step on the way to owning that house is your mortgage. Ulster Bank is in the business of helping people realise their home ownership dreams and are there to help you through the process. Debbie Boyle, a Mobile Mortgage Manager with Ulster Bank, says: “At Ulster Bank, we know that buying a house is so much more than a transaction - it’s a putting down of roots. That’s why at Ulster Bank, we do all we can to help make the mortgage process easier. So the more headspace we can clear for our customers, so they’re free to focus on the next place they’ll call home, the better”. To talk to Ulster Bank about your mortgage click here.